DSC00051, originally uploaded by m8parco. In life we face detours and challenges. We face this in all aspects of our life. 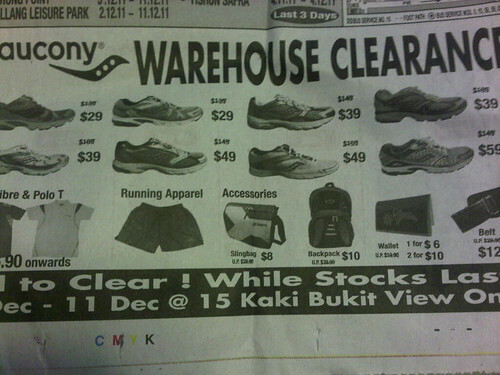 Running was a big part of my high school and college life. It helped boost the confidence of short, thin, underachieving student. Not being able to run put a serious dent to my psyche. I remember when I first broke my knee and I eventually needed to have an ACL to prevent it from deteriorating any further. There was nothing worse then walking into a hospital perfectly fine and then rolling out on a wheelchair. The rehabilitation was long hard and very trying. It was small steps and i slowly got better. i hurt my knee again and did a better job on my second round of rehab and therapy. I always kept a brave face. I finally recovered and i continue to run. I was finally able to run a Marathon and I would dabble in triathlons when I had time. But in the last two years i have been bothered by a common medical problem gnetically inherited from my mom. I was finally getting better but last month when the symptoms appeared again. I went to see the doctor and scans confirmed it. 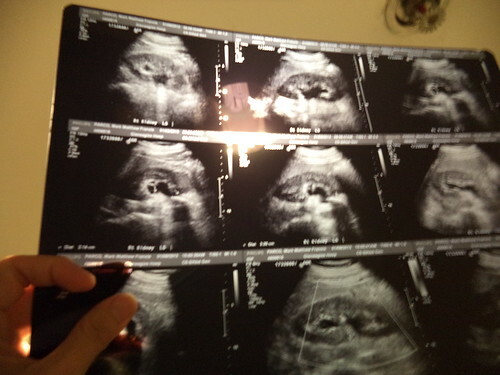 I went for the procedure and after three weeks of recovery I took another scan. The X-ray was inconclusive so I had to go for a CT scan. Lo and behold my prayers were answered. It’s almost completely clear and I have gotten the green light to carry on with my life. I know it can come again so I need to adjust my diet and keep an eye for any symptoms. It’s true what they say. It’s not how many times you fall but how many times you pick yourself up and wipe dust of your body, put on a big smile and carry on. 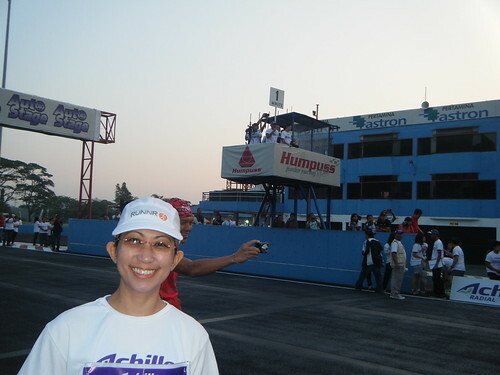 The Animo triathlon in December is right at my backyard and I look forward crossing the finish line. Remember to never lose hope and see you all at the starting line..
DSCF2376, originally uploaded by m8parco. DSCF2343, originally uploaded by m8parco. Last week we joined the Standard Chartered 10K and Half Marathon race in BSD City in Tangerang, a suburb to the west of Jakarta. 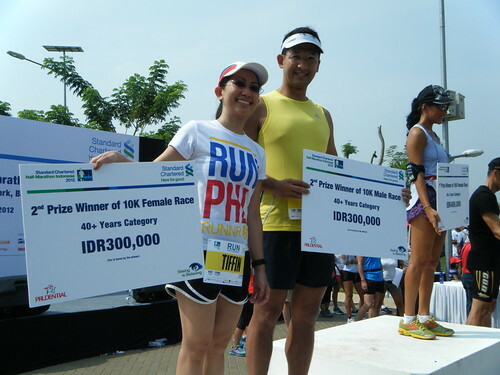 We picked this race over the Allianz 10K run held in Sudirman Jakarta. We get to run in Sudriman every Saturday and it really get crowded becaus they close the streets and it is filled with cyclist and other fitness enthusiasts. We had a great time and as a bonus Tiffin and Eric won 2nd place in their age category for the 10k. I hope they keep it u. King of the Road 2012, originally uploaded by m8parco. I am all set for the King of the Road race in Indonesia. 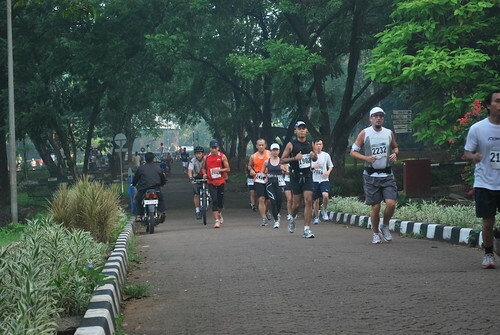 They have a new course in BSD city which should make it interesting. My training is going well but I don’t think I have done enough long runs. But I guess we always feel we have not done enough. 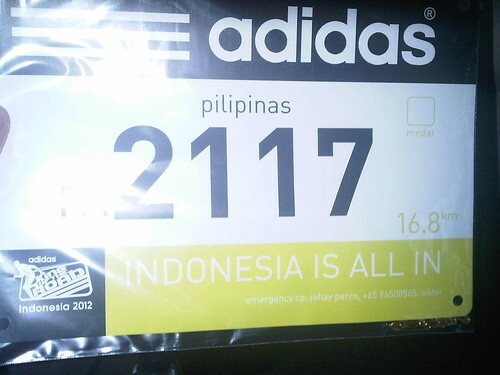 I plan to run and enjoy the race. Sentul3, originally uploaded by m8parco. 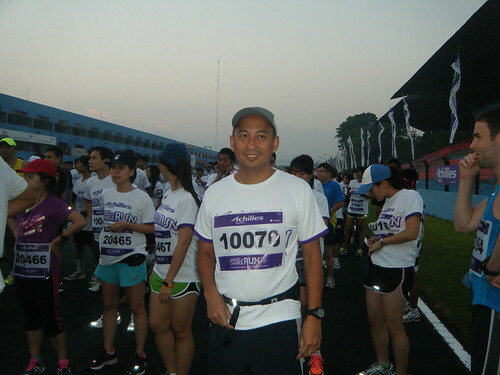 The last time I ran a sub 5 minutes/ Kilometer pace was in July 2011. I did a 49 minute 10K. After that it was all downhill. But yesterday I finally broke the duck. I completed 11.85 kilometers in 58:14. I was breaking in my soleus gps watch and my overeagerness almost got the better of me. I flew to a 4:30 in the first kilometer but I was finally able to reign in my excitement and settled for a 5 min / k pace. The wind was really blowing at the far side of the track. It was a 3 loop race and in the 2nd loop I tucked behind some runners to preserve my strenght. I imagined they were rabbits pacing me. 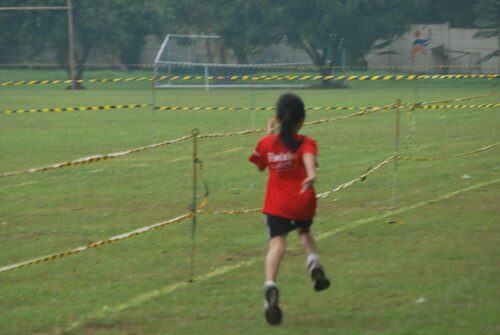 In the last lap I ran by myself most of the time as I pulled away from the pacers. The soleus gps watch worked well but I will need to spend more time to maximize the features. I deleted all my records whenn I was reviewing the records. Bummer, I really wanted to review my kilometer splits. It was nice to see my training starting to pay off again and I hope my health issues don’t crop up again. Sentul1, originally uploaded by m8parco. We had a great race at the Sentul race circuit up in the Bogor highlands. 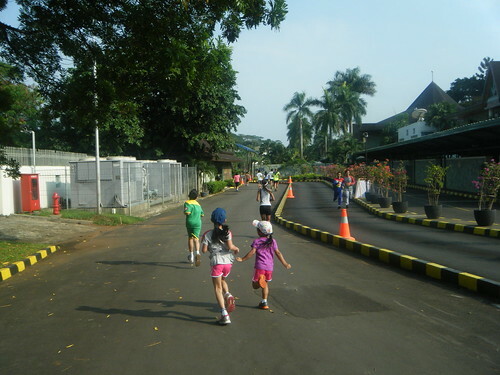 The race circuit is a 3.95km loop and we ran 3 loops. The weather was gorgeous but it was windy in most parts of the course. It had Baguio like weather especially since the race started at 6 :00 am. Tiff had a great race running a 1:07. The ERC running club was there in full force. We all enjoyed the nice cool race except for the wind. After the race we all sauntered down to Raffy’s place for lunch and drinks.